TUESDAY, Oct. 27, 2015 (HealthDay News) -- A common type of heartburn medication called proton pump inhibitors (PPIs) seem to be linked with increased risk of chronic kidney disease, two new studies suggest. While the current studies have shown an association between these drugs and the development of chronic kidney disease, they did not prove a cause-and-effect relationship. Still, the lead author of one of the studies believes, "It is very reasonable to assume that PPIs themselves can cause chronic kidney disease," said Dr. Pradeep Arora, a nephrologist and associate professor at the SUNY Buffalo School of Medicine and Biomedical Science in Buffalo, N.Y.
"Patients should only use PPIs for [U.S. Food and Drug Administration]-approved indications, and not to treat simple heartburn or [indigestion]," he cautioned. Chronic kidney disease is increasing in the United States, with more than 20 million Americans now suffering with it, according to the American Society of Nephrology. This occurs when a person's kidneys become damaged and can't filter blood as they should. Diabetes and high blood pressure are two common risk factors for kidney disease, the society said. Previously, PPIs have been tied to short-term kidney problems like acute kidney injury and an inflammatory kidney disease called acute interstitial nephritis, Arora said. Arora's study involved more than 24,000 patients who developed chronic kidney disease between 2001 and 2008. One out of four of the kidney patients had been previously treated using a PPI. People taking a PPI also had nearly twice the risk of dying prematurely, the researchers found. In the second study, researchers were led by Dr. Benjamin Lazarus from Royal Brisbane and Women's Hospital in Australia, and Johns Hopkins University in Baltimore. They followed more than 10,000 adults with normal kidney function from 1996 to 2011. They found that PPI users were up to 50 percent more likely to develop chronic kidney disease than non-PPI users, even after adjusting for differences between the two groups. The researchers pointed out that people did not have a higher risk of chronic kidney disease if they used a different class of drugs called H2-blockers that also suppress stomach acid. Tagamet and Zantac are included in this drug group. The same team also replicated this link in a larger second study that followed 240,000 patients from 1997 to 2014, the researchers said. Findings from the studies are scheduled to be presented next week at the American Society of Nephrology's annual meeting in San Diego. Data and conclusions presented at meetings are usually considered preliminary until published in a peer-reviewed medical journal. Arora said there are a couple of theories that might explain this link between PPIs and chronic kidney disease. 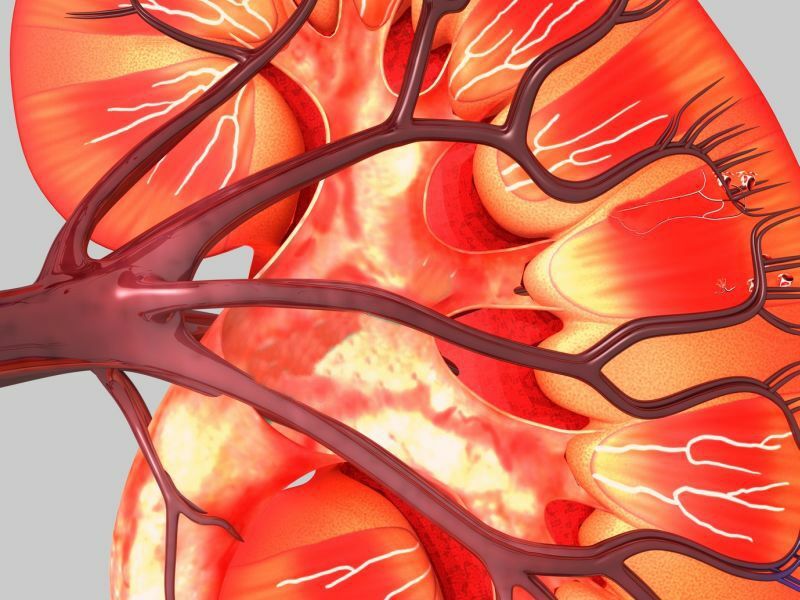 The kidneys might become damaged over time if patients suffer repeated bouts of acute interstitial nephritis (a form of tissue inflammation), which has been linked with short-term use of PPIs, he said. PPIs also can cause magnesium levels in the blood to decline. A lack of this important mineral might also cause damage to the kidneys, Arora added. However, patients who take PPIs also tend to be obese and have other health problems such as diabetes, and these conditions might explain the observed link, said Dr. Michael Wolfe, a gastroenterologist and professor of medicine at Case Western Reserve University School of Medicine in Cleveland. Sick patients also take a lot of painkilling NSAIDs, or nonsteroidal anti-inflammatory drugs, and those over-the-counter medications also have been tied to chronic kidney disease, he said. "I suspect if [researchers] correct for NSAID use, they will see this correlation disappear," Wolfe said. Arora said that his research team did not initially account for NSAID use in the study, but did control for other health problems. "We did not [control the data for NSAID use], but we have the data for NSAID use and we are looking over that," he said. "That is a very good point." Arora recommends that people only use proton pump inhibitors to treat serious gastrointestinal disorders like GERD, as originally intended by the FDA. "According to U.S. data, 90 percent of the prescriptions for PPI are not related to FDA-approved indications," he said. "We are using this medication right and left, and it may be counterproductive for many patients." SOURCES: Pradeep Arora, M.D., nephrologist and associate professor, SUNY Buffalo School of Medicine and Biomedical Science, Buffalo, N.Y.; M. Michael Wolfe, M.D., gastroenterologist and professor, medicine, Case Western Reserve University School of Medicine, Cleveland, Ohio; Nov. 3-8, 2015, presentations, American Society of Nephrology, annual meeting, San Diego, Calif.